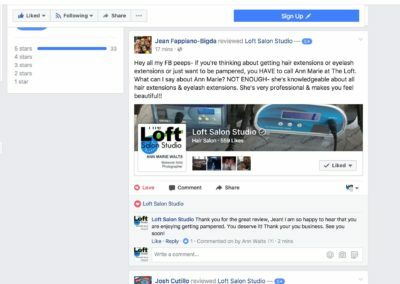 ⭐️⭐️⭐️⭐️⭐️Reviews Of The Loft Salon Studio-" THE place for hair extensions. When is the last time you loved your hair? 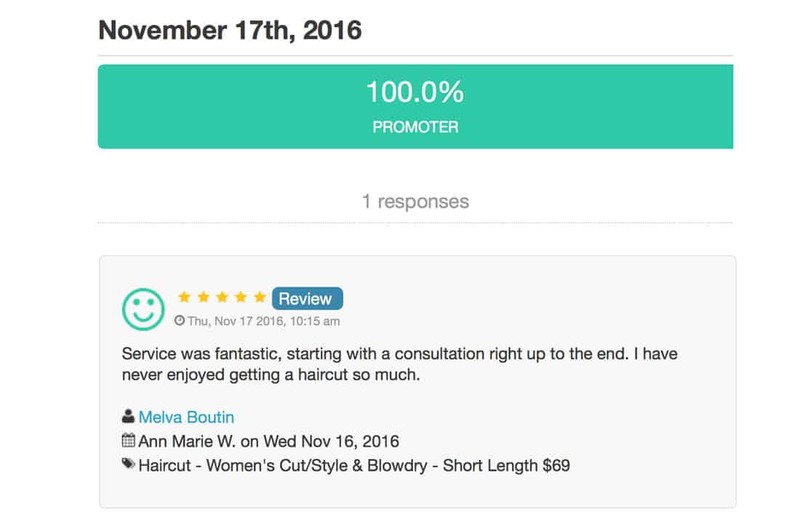 Hear what Clients are saying…..
⭐️⭐️⭐️⭐️⭐️ You can tell she really cares about YOU and not just making a buck. 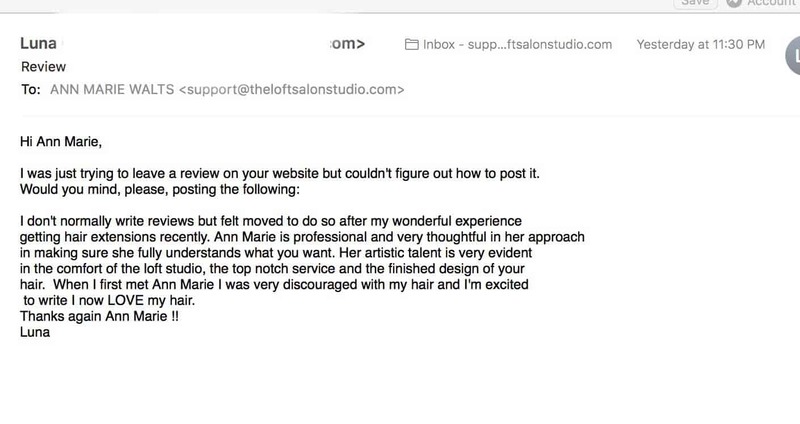 ⭐️⭐️⭐️⭐️⭐️Reviews Of Loft Salon Studio – She’s very professional & makes you feel beautiful!! AMAZING!! That’s the only word I can think of to describe Ann Marie!! I had hair extensions done and I left The Loft feeling great! This morning I left for work feeling confident and looking good!! Ann Marie is so knowledgeable about what she does. She explained everything to me from the process to the products. (I’m talking down to the molecules!) My hair had a few different shades of blonde and even some brown. 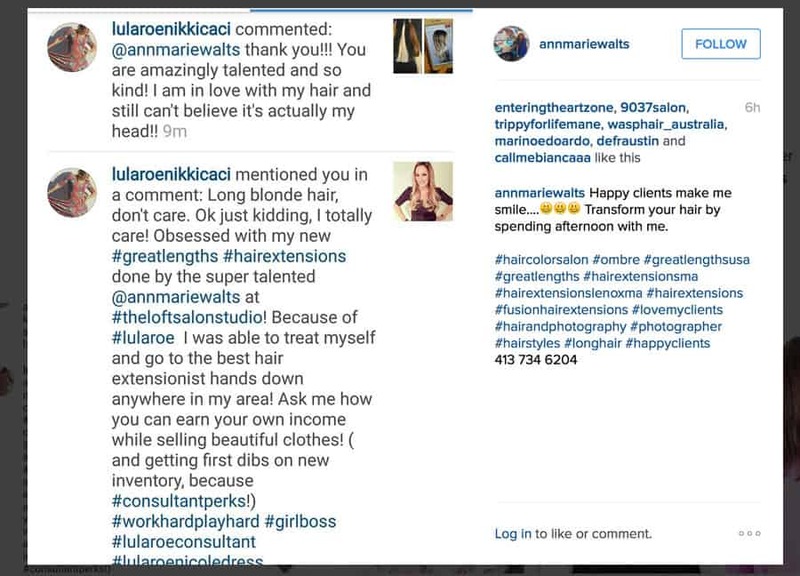 Ann Marie customized each extension so that it would flawlessly blend with my color. You can’t tell the different between the extensions and my natural hair. She makes you feel comfortable and is so easy to gab with! By the time I got home I already had an email with aftercare instructions and when I woke up this morning I had an email with a how-to for each of the products I went home with. A cheat sheet that I can use until I’m familiar with them. As a bonus Ann Marie is inspiring!! She has the best stories and you can tell that she absolutely loves what she does. Her patience and attention to detail is astounding. Worth every penny!! I did a lot of research before I decided to go ahead with extensions and everything I came up with pointed to The Loft. Thank you, Ann Marie!!! I cannot share enough how much I enjoy Ann Marie Walts’ expertise. She really takes her time with all that she does. I have had my hair color and my eyelash extensions done by her. The results were so very natural looking. My hair was left in excellent condition and it was amazing to not have to wear mascara or barely any makeup anymore, because of my lashes. Additionally, I used her for what I needed for photography. She sees things through her lens that will bring the moments you want to last a lifetime stay with you forever in the pictures she takes. She doesn’t just take pictures, she captures the story. Being the lead singer of a band, I have had many pictures taken of me over the years. Nothing can compare to the way Ann Marie can catch the beautiful moments that are real, either by directing the shot or just capturing those moments you think no one else saw, she does. You can see the feeling in the picture and that’s what I’ve found is so rare and what I have found in Ann Marie’s work. If you want a photographer who is a true professional artist, look no further. “Liese T. – One Sentence: Not for everyone, but if you try it, you won’t regret it! 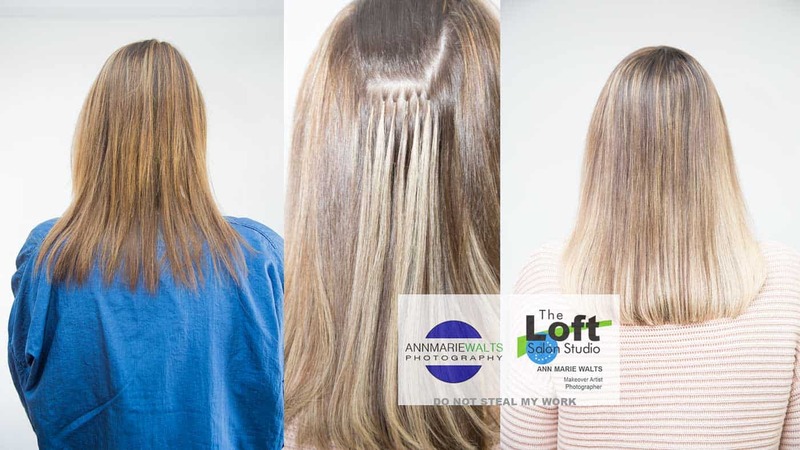 I will start by saying I can be VERY fussy when it comes to my hair (as most women are), but I was completely blown away by Ann Marie’s talents and results! I have actually gone 3 times, twice for my hair color, and once for a pedicure – all three experiences were great! 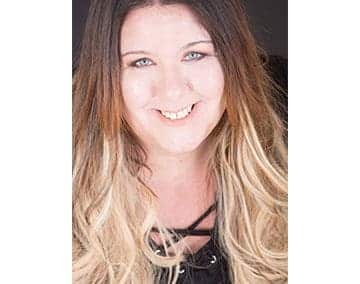 Ann Marie is a bubbly, and lovely, she’s always smiling, and really takes the time to listen to what you want, what you’re looking for, and takes the time to explain what she’s going to do! Both times I’ve been for my hair, I’ve had dramatic changes, and she’s helped my achieve both looks, and I’ve come out with a big smile across my face (I’m still wearing my last time). Some may be put off by a couple of things. 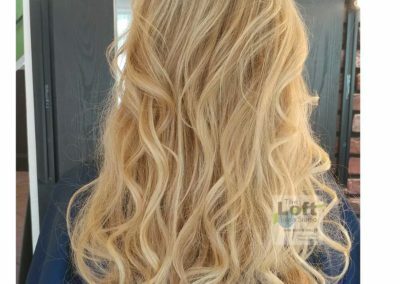 Firstly, the consultation, if you’re anything like me, hair appointments are difficult to make, and to have to book a consultation FIRST, it felt like I was wasting my time – turns out, NOT – It really gave Ann Marie the knowledge she needed, and my hair turned out better than I could imagine. Kelli D.5.0 star rating Absolutely the BEST pedicure I have ever had!!! 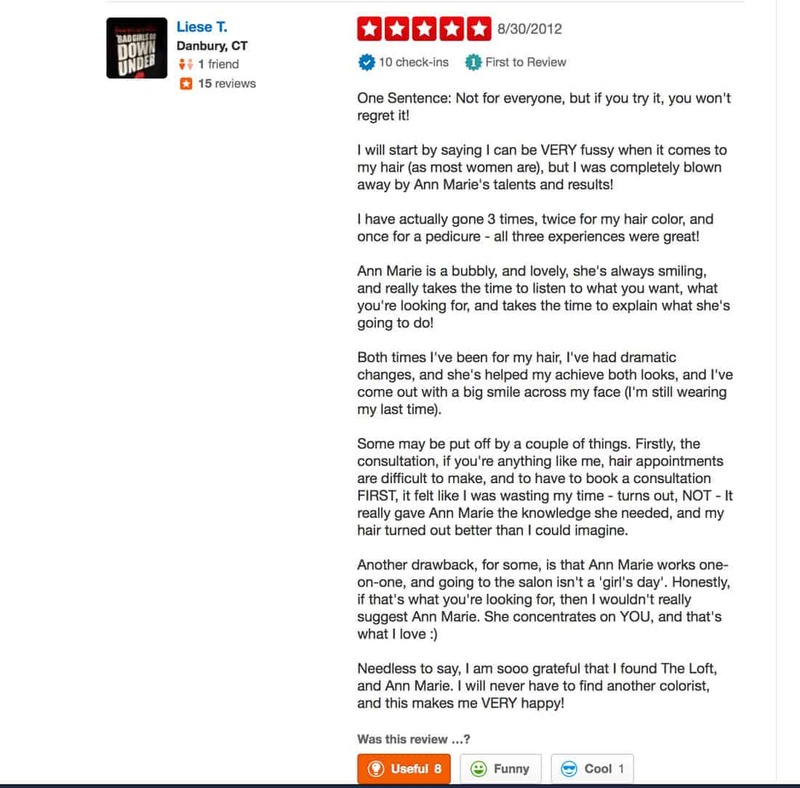 Ann Marie takes time to make sure you are completely satisfied before leaving. The salon is clean, modern & very welcoming. I would recommend this salon to anyone who wants an hour or 2 to themselves for total relaxation & laughs. I’m so happy with my choice to visit The Loft & will definitely be back for more!! ★★★★★ a month agoI couldn’t be happier with Ann Marie’s work. Not only is she talented and creative with problem correction, her instinct about personal style is amazing. I recommend her highly!! Cami MesserI simply cannot express what a relaxing experience I had. 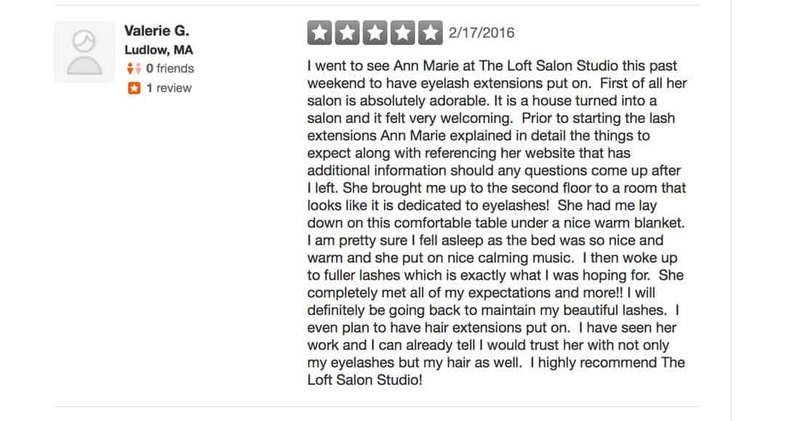 A friend of mine just got her eyelash extensions done and recommended that I go see Ann Marie. I can share that I was a bit nervous at first but after I went in and everything about my service was explained then I knew I was in good hands. I absolutely LOVE my Xtreme Lashes. I even fell asleep during my appointment. I will be definitely going back and highly recommend her services. It is rare for me to get time for myself because I have four kids and not much time. Not only are her hands creative, they are very powerful and skilled. My pedicure was phenomenal! And you’re not waiting for a ‘station’. You have Ann’s complete attention and focus(which allows for some really funny conversations:-). The tape-in extensions are fabulous! They look natural and pretty. I wasn’t out of the salon for 5 minutes when I started receiving compliments from strangers. Ann Marie is beyond an expert when it comes to hair. 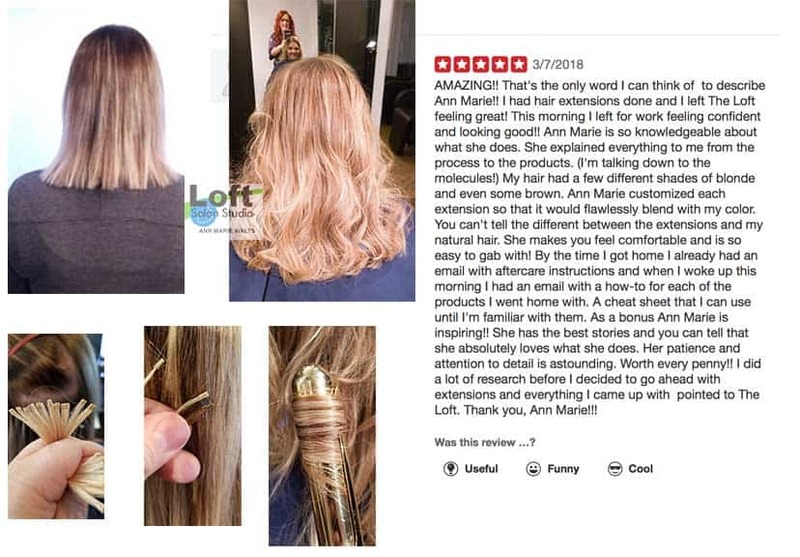 ★★★★★My first appointment with Ann Marie was yesterday and I still find myself looking in the mirror to get another look at the fantastic haircut and fab color. I entered the salon with blonde hair and a conservative cut and walked out with exactly what I wanted–but didn’t realize until I saw it: red hair and a artful and slightly edgy cut. I’m thrilled!!! The interview process helped so much in identifying what I really wanted from my visit to the salon. 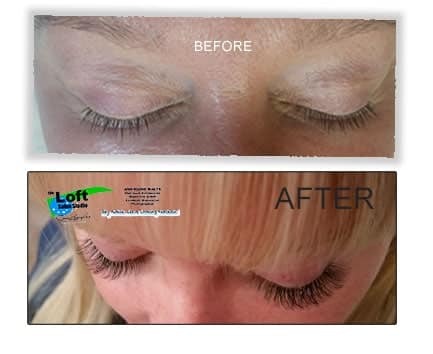 I have maintained regular appointments with Ann Marie at the Loft Salon Studio For eyelash extension applications for the past 6 months. I am ecstatic about how natural my eyelashes look; and I thoroughly enjoy Ann Marie’s attention to perfection ! She is the consummate professional…and she also makes the experience lots of fun and relaxing. I regularly travel to NYC to visit my children and do most of my shopping and self care, including haircuts in the city. 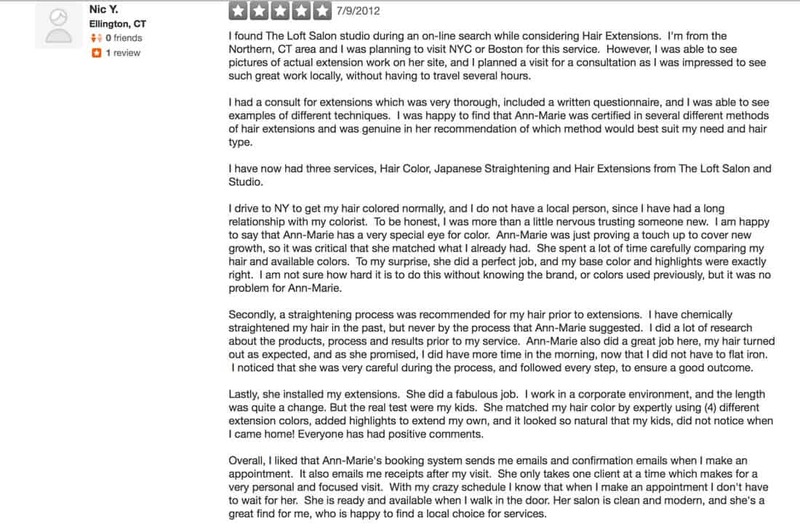 I will NEVER replace Ann Marie with an expert in New York. She is irreplacable !!! TEN STAR RATING !!!!!!!!! I couldn’t have asked for better! AMAZING! I have known Ann Marie for many years now, and she is by far the best hair stylist I have ever been to. 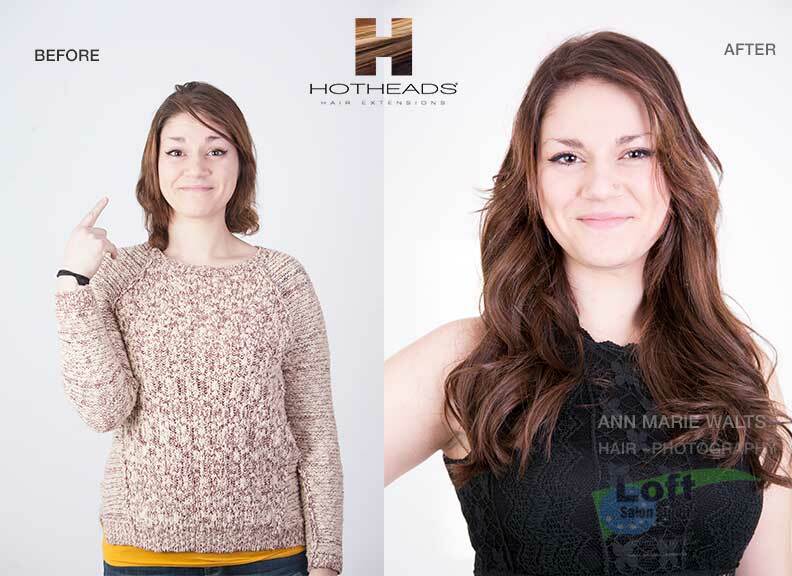 She is so welcoming, and will listen to you and will recommend hairstyles that she feels best suits you. I recently agreed to be Ann Marie’s mock bride in the upcoming bridal show and to get Great Lengths Hair Extensions. That was by far the best choice I have EVER made! I LOVE my Great Lengths Hair Extensions! She did an amazing job with the application, and people can’t even tell where my natural hair is, they blend so well! The Great Lengths feel so natural, like your own hair, and you can style them every which way; they are AMAZING! 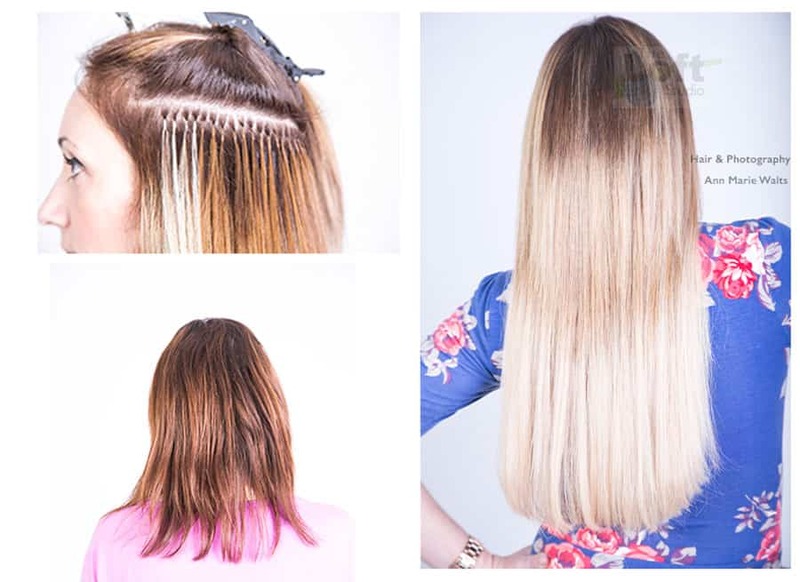 I would recommend Great Lengths Hair Extensions to anyone, and if you are looking for a really good hair stylist to apply them, going to Ann Marie. She’s the best! I would recommend her for anyone who wants a change or who wants to touch up/update their look! 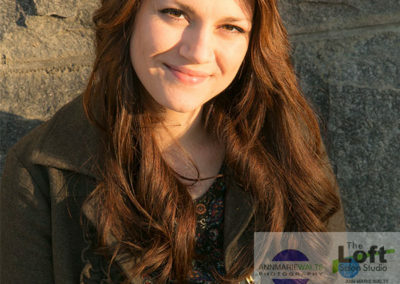 Ann Marie is extremely talented in the many things she does and also has a wonderful personality. She considers everything you tell her, which you will see after filling out her consultation form, analyzes your hair (or whichever service you are in for), and comes to a decision, which made me feel very comfortable with what she says and does. I did the Japanese hair straightening and eyelash extensions with her this past weekend, and she did an amazing job. She takes her time, and she really does one-on-one work. I was the only customer with her for about 9 hours! Not surprisingly, I love the results!! In fact, she went out of her way to accomodate me, which really, really helped me out. I will definitely be going back again to take advantage of the awesome services she has to offer. Thanks so much Ann Marie, and keep up the amazing work!!! I went to the Loft to change over from a blonde to a brunette. Ann Marie made me feel so welcome and comfortable. She was really open to ideas, and unlike many other salons she was very open for change. Her style of work was very acurate and thorough. She is a natural, with an artistic eye that i trust. She took some great pictures of my hair after the change, and I posted them on my facebook page, and it just blew up!! Everyone was amazed at the amazing job Ann Marie did, and the amazing color of my hair!! I also got lash extensions. I absolutely love them! I never even where mascara now, my lashes are so long and it looks so natural. I wear contacts, and they are so comfotable. I forget i even have them, until someone gives me a complient 🙂 . Its such a great Salon with so much to offer the client. Ann Marie is such a sweetheart, she took very good care of me while she was dying my hair. She was very professional and knew exactly what she was doing. I would recommend her to anyone, the time she invests in you and the effort she puts forth is truly amazing. I highly recommend her and her business. Thank you Ann Marie! 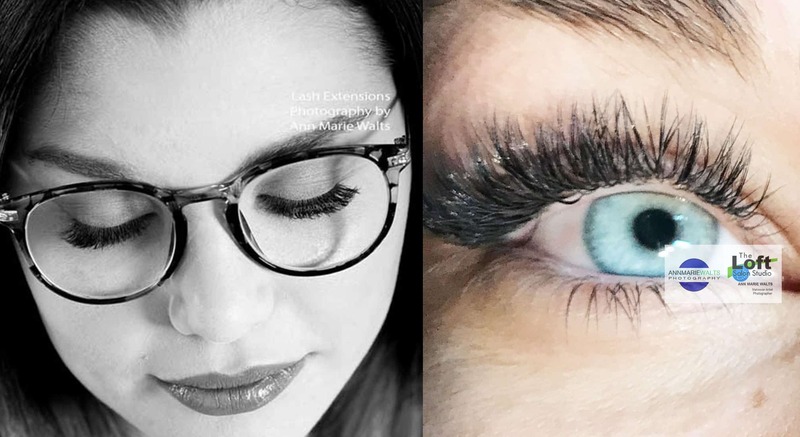 “Ann Marie is a lash magician! I got my lashes done for the first time and the results are AMAZING! All of my friends keep asking where I got them done because they look so full and lush. 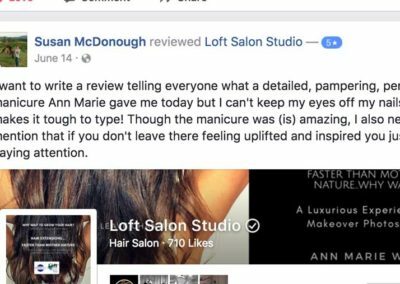 “In my experience, once you visit The Loft Salon and Ann Marie, you will NEVER want to go ANYWHERE ELSE. Ann Marie’s skills are amazing and was able to accomplish in one visit the look i had been trying to accomplish since i was 16 and first started coloring my hair. After countless visits to multiple different salons i began to think the look i was going for couldnt be done on me because of my own hair texture and what not. Ann Marie shocked me and made it possible. I had never left a salon so happy. Also, aside from her skills, her attitude and humbleness make it so comforting whereas in most salons where your sitting in their chair for a number of hours I am antsy and i usually ask them to not even blow dry because i just want to get out! I could have stayed longer and talked with Ann Marie, HAH! Joey ! 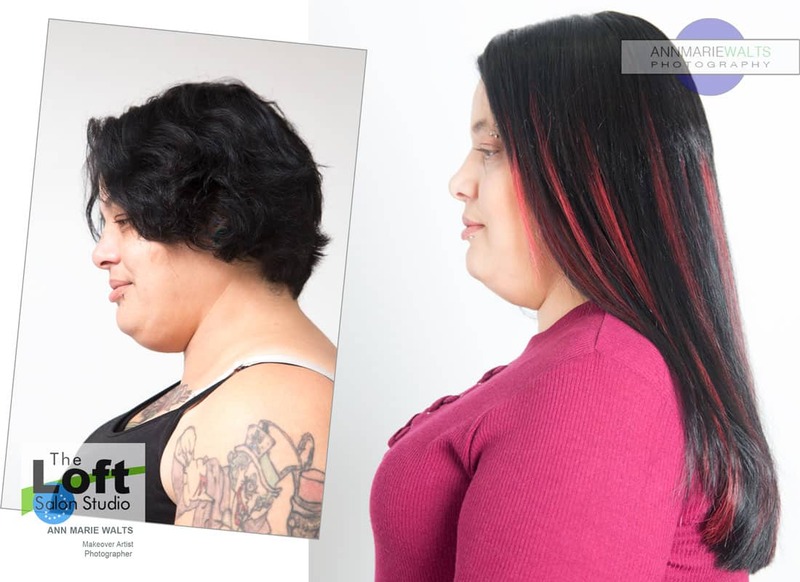 – Kerri T.
I recently had my hair done by Ann Marie and I am absolutely in love with everything she did! She transformed my hair completely and it looks amazing. I went in with dirty blonde hair and left with a deep brown beautiful color with extensions. The process of getting them installed took all day but we had a lot of fun. We ate food, watched netflix, listen to music and got to finish the day with a great photo shoot with the finished product. I am beyond pleased with how everything turned out and the service was spectacular. I felt extremely comfortable with everything due to the fact Ann knows everything about what she’s doing down to the littlest detail. She really cares about making you happy and making sure you are nothing short of satisfied. GO SEE HER!!!!!!!! 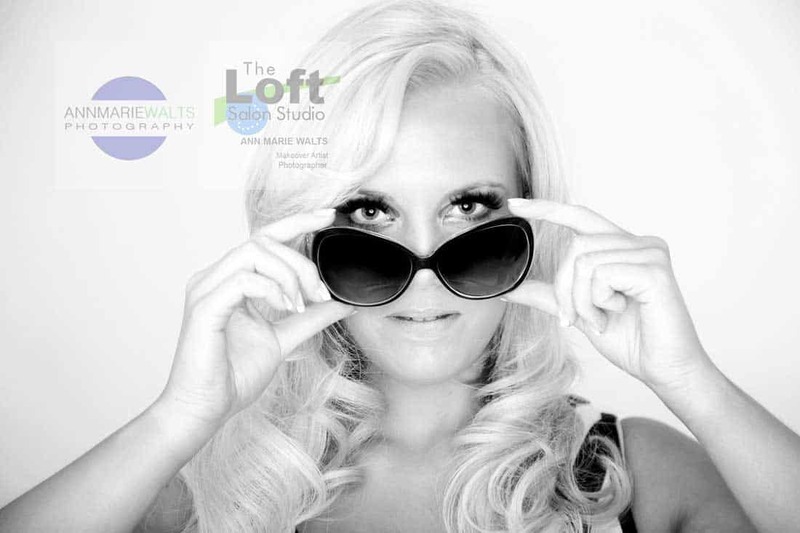 The Loft Salon Studio is absolutely incredible. We cut about 5 inches off my hair and as nervous as I was, I have never been happier with the results. I have very thick, damaged hair and I dont trust anyone but Ann Marie to cut it. I highly recommend this salon. Today was the most wonderful day of my life I had the best experience and made a new friend for life my husband loves my new hair and my extensions look 100% natural. I would tell anyone looking to get extensions to come here where u will be treated like a princess. Walk in a hot mess and come out looking like a model. Hollywood treatment without the Hollywood prices! Tara B.
I have been back to the salon 4 times for the bio ionic straightening. If you are looking for an unparalleled experience where you are the only customer in the salon and are treated with uncompromising service this is where you go and the reason I’m a customer for life! 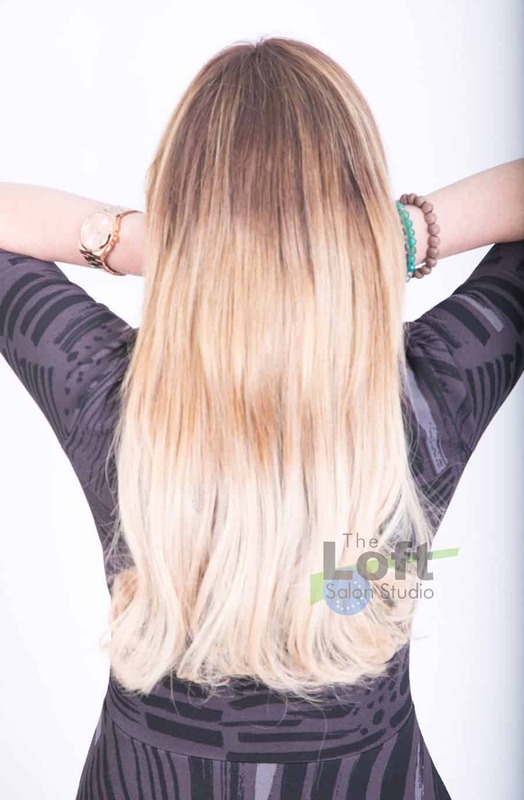 Obsessed with my new #greatlengths #hairextensions done by the super talented @annmariewalts at #theloftsalonstudi0! Because of my #lularoe.I was able to treat myself an go to the best hair extensionist hands down anywhere in my area! 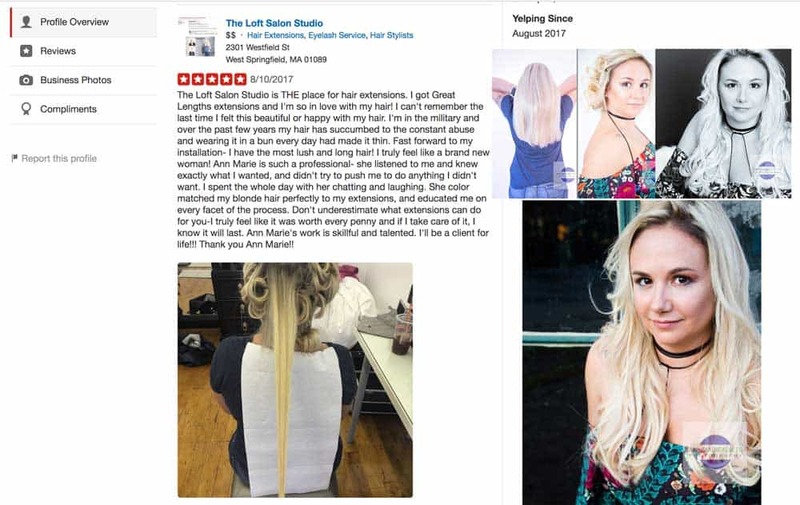 I found Anne Marie through searching for stylists that did great lengths hair extensions in Western MA and stalked her Instagram for a while before finally contacting her for a consultation. I had fusion extensions that were slipping out left and right and I knew that I wanted them done professionally. I was so impressed with everything she had done online so was a little intimidated going into the consultation. Once I got there and met with her, those feelings were completely forgotten about. Anne Marie is so warm and welcoming and I could tell immediately that she absolutely loves what she does! Her confidence and enthusiasm made me feel so good about being there. We looked at pictures of where I was hoping to me and she analyzed how to get there. It was so refreshing to have a stylist really listen to me! At the end of my consultation, which felt way more like a chat with someone I’ve known for a long time, she gave me three options of what she could do for my hair, with a full explanation of each, at three different price points. There was no pressure to go with any of them, she was just giving her professional opinion. 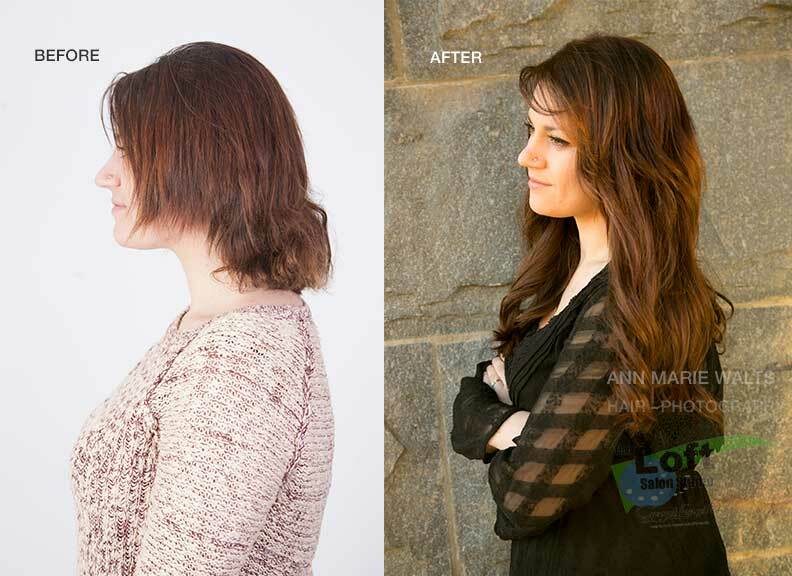 I decided then to book what I had gone in looking for which was a full color makeover, and great lengths extensions. We booked a date that worked with both of our schedules, which was about three weeks out. Knowing I was anxious to get my hair done, she called to get me in as soon as she could, earlier than my original appointment. 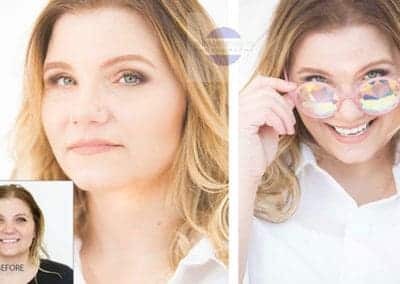 We had talked at length about the color I wanted, which was a dark brown to very white blonde ombré, and she spoke to Great Lengths and was able to order specially colored hair that matched exactly what I was looking for, and chose a few complementing shades to weave in between. When I arrived the day of my appointment and saw the colors, I was amazed at how perfect they were! She spent the early part of the day coloring my natural hair, and after a lunch break we began the extension process. i thought it would be a long and tedious process, but as a busy mom and small business owner I found it was the most relaxing time I have had in forever! Anne Marie put my feet up, gave me comfy blankets and pillows, and played funny movies for me the entire time she was working her magic on my hair. The hours flew by and before I knew it she was done! When I finally saw my hair and the colors all together I was speechless! I felt absolutely beautiful! She took my after pics and was kind enough to take pictures that I can use for my clothing business- she has such a fun and creative energy! She sent me home with all of the products I need to take care of my extensions. I can’t say enough about now perfect they are- you would never be able tell that I was wearing extensions! and the color is absolutely beautiful- a “natural” sunkissed looking ombré. Thank your for my “Pinterest” hair! I can’t say enough about Anne Marie! She obviously has the experience behind her, but she is up with every new trend and is always looking forward to what is next and has the knowledge to do it! She is an artist in what she does. I simply cannot express what a relaxing experience I had. 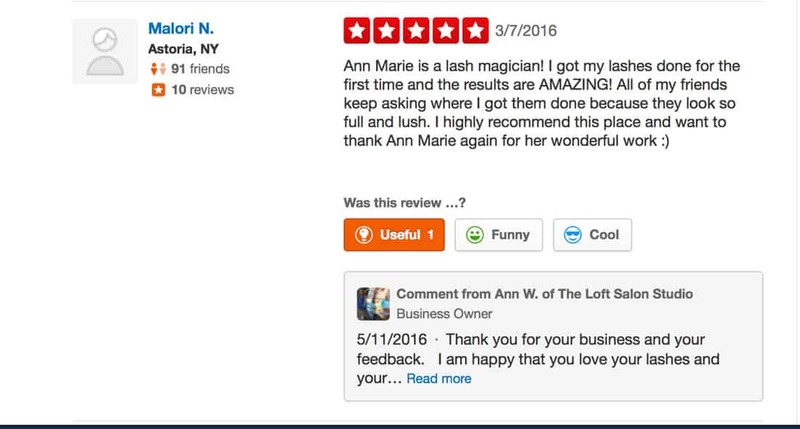 A friend of mine just got her eyelash extensions done and recommended that I go see Ann Marie. I can share that I was a bit nervous at first but after I went in and everything about my service was explained then I knew I was in good hands. I absolutely LOVE my Xtreme Lashes. I even fell asleep during my appointment. I will be definitely going back and highly recommend her services. It is rare for me to get time for myself because I have four kids and not much time. Cami M.
Nothing like a short nap and waking up looking younger!! Thanks for making my mornings easier on the “eyes”! 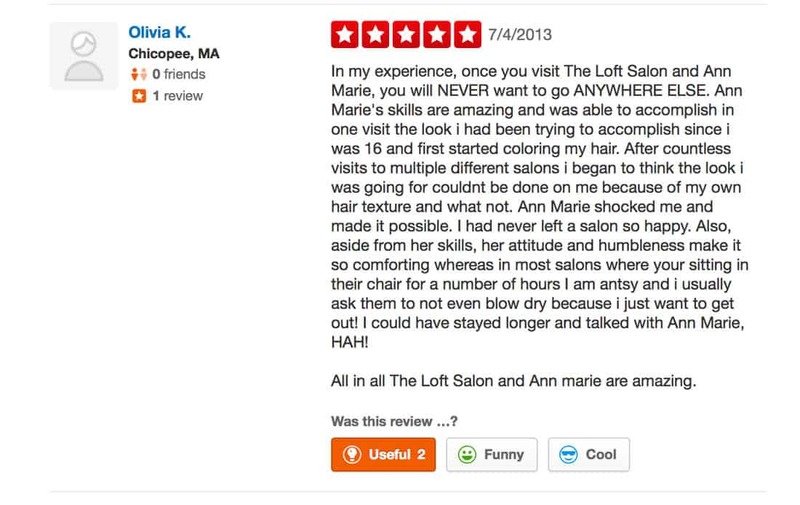 Laura W.
In my experience, once you visit The Loft Salon and Ann Marie, you will NEVER want to go ANYWHERE ELSE. Ann Marie’s skills are amazing and was able to accomplish in one visit the look i had been trying to accomplish since i was 16 and first started coloring my hair. After countless visits to multiple different salons i began to think the look i was going for couldnt be done on me because of my own hair texture and what not. Ann Marie shocked me and made it possible. I had never left a salon so happy. Also, aside from her skills, her attitude and humbleness make it so comforting whereas in most salons where your sitting in their chair for a number of hours I am antsy and i usually ask them to not even blow dry because i just want to get out! I could have stayed longer and talked with Ann Marie, HAH! 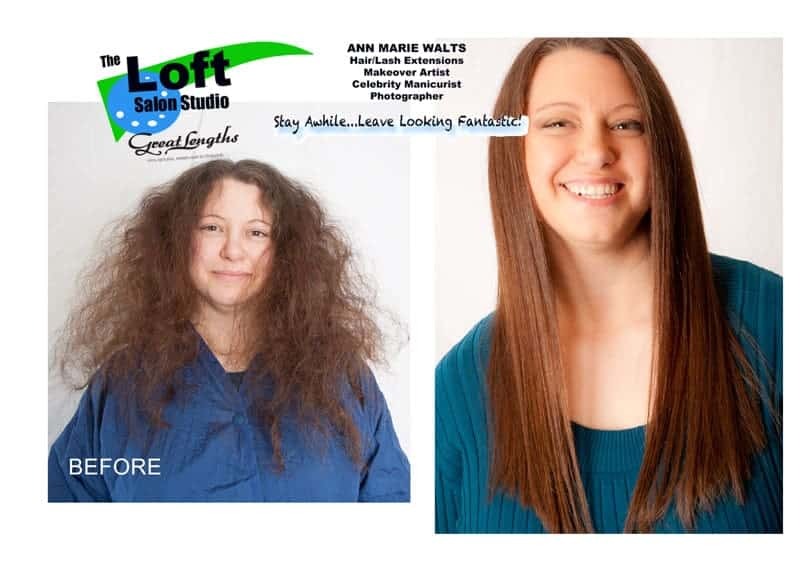 All in all The Loft Salon and Ann marie are amazing. Olivia K.
I went to the Loft to change over from a blonde to a brunette. Ann Marie made me feel so welcome and comfortable. She was really open to ideas, and unlike many other salons she was very open for change. Her style of work was very acurate and thorough. She is a natural, with an artistic eye that i trust. She took some great pictures of my hair after the change, and I posted them on my facebook page, and it just blew up!! Everyone was amazed at the amazing job Ann Marie did, and the amazing color of my hair!! I also got lash extensions. I absolutely love them! I never even where mascara now, my lashes are so long and it looks so natural. I wear contacts, and they are so comfotable. I forget i even have them, until someone gives me a complient 🙂 . Its such a great Salon with so much to offer the client. 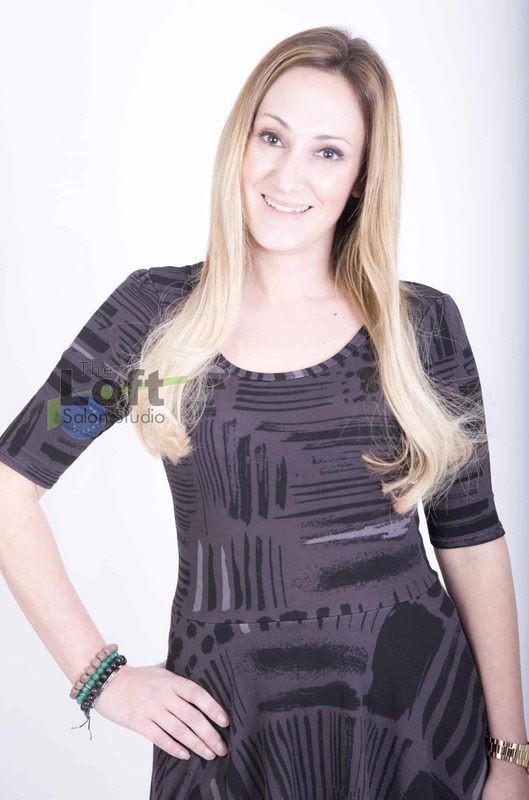 Laurie C.
I found The Loft Salon studio during an on-line search while considering Hair Extensions. I’m from the Northern, CT area and I was planning to visit NYC or Boston for this service. However, I was able to see pictures of actual extension work on her site, and I planned a visit for a consultation as I was impressed to see such great work locally, without having to travel several hours. I had a consult for extensions which was very thorough, included a written questionnaire, and I was able to see examples of different techniques. 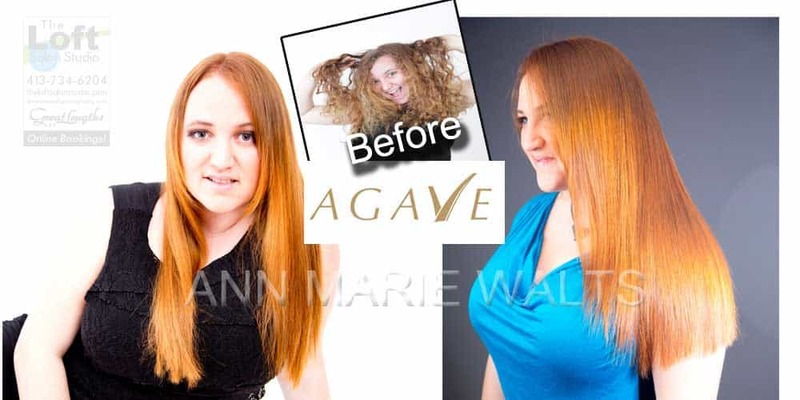 I was happy to find that Ann-Marie was certified in several different methods of hair extensions and was genuine in her recommendation of which method would best suit my need and hair type. 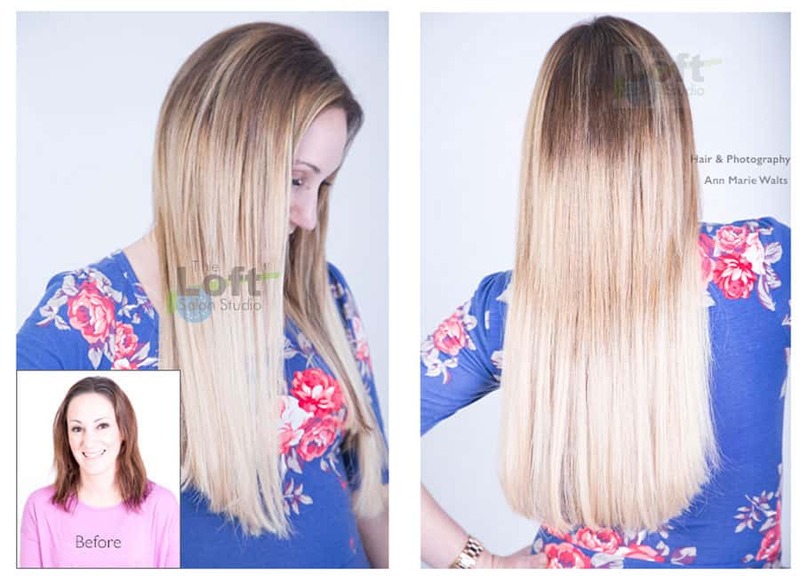 I have now had three services, Hair Color, Japanese Straightening and Hair Extensions from The Loft Salon and Studio. I drive to NY to get my hair colored normally, and I do not have a local person, since I have had a long relationship with my colorist. To be honest, I was more than a little nervous trusting someone new. I am happy to say that Ann-Marie has a very special eye for color. Ann-Marie was just proving a touch up to cover new growth, so it was critical that she matched what I already had. She spent a lot of time carefully comparing my hair and available colors. To my surprise, she did a perfect job, and my base color and highlights were exactly right. I am not sure how hard it is to do this without knowing the brand, or colors used previously, but it was no problem for Ann-Marie. Secondly, a straightening process was recommended for my hair prior to extensions. I have chemically straightened my hair in the past, but never by the process that Ann-Marie suggested. I did a lot of research about the products, process and results prior to my service. Ann-Marie also did a great job here, my hair turned out as expected, and as she promised, I did have more time in the morning, now that I did not have to flat iron. I noticed that she was very careful during the process, and followed every step, to ensure a good outcome. Lastly, she installed my extensions. She did a fabulous job. I work in a corporate environment, and the length was quite a change. But the real test were my kids. She matched my hair color by expertly using (4) different extension colors, added highlights to extend my own, and it looked so natural that my kids, did not notice when I came home! Everyone has had positive comments. Overall, I liked that Ann-Marie’s booking system sends me emails and confirmation emails when I make an appointment. It also emails me receipts after my visit. She only takes one client at a time which makes for a very personal and focused visit. With my crazy schedule I know that when I make an appointment I don’t have to wait for her. She is ready and available when I walk in the door. Her salon is clean and modern, and she’s a great find for me, who is happy to find a local choice for services. Nicole Y. 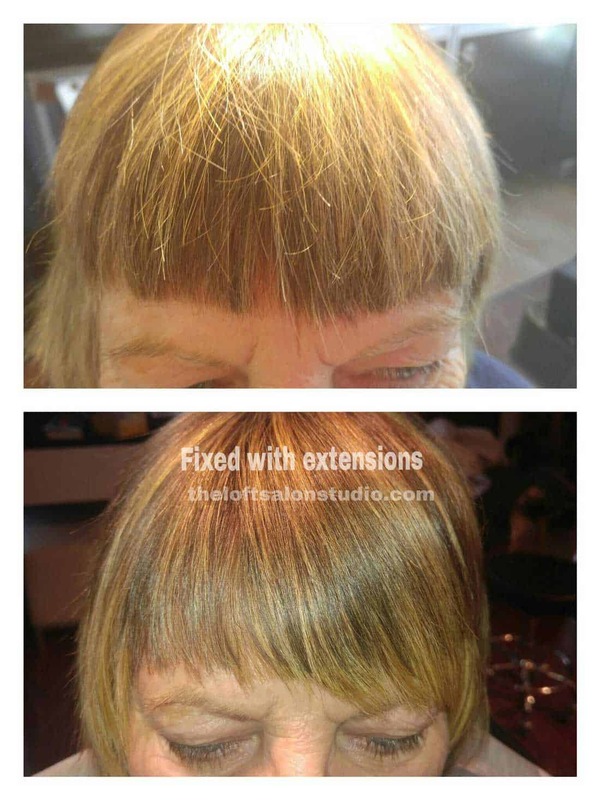 My hair was very damaged and Ann Marie recommended a few steps before doing my extension work. Ann Marie did a retro straightening on my hair as well as color correction with Schwarzkopf hair coloring. After treating my hair is was soft and gorgeous, Ann Marie then went ahead and placed my extensions. She picked out colors that would work with my skin tone and made my eyes pop. The work was gorgeous. Ann Marie also did my hair,makeup and photos for my wedding. The removal of the extensions were painless and there was NO damage to my hair. My hair still looks great! Thank you Ann Marie for all you’ve done. 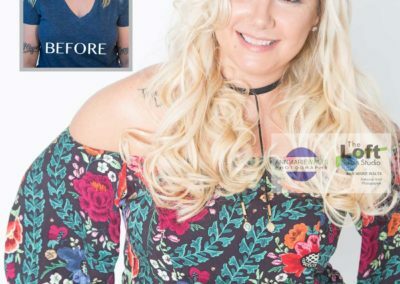 Your styling is the best and I would highly recommend many to you for services epically the great lengths hair extensions..the rumors about extensions ruining hair is all wrong! My hair is beautiful thanks to Ann marie (: she’s the best.